. The higher horsepower makes it even easier to cut down tall, tough plants. But it's not just about power. These trimmers also have bigger trimmer heads that allow them to trim wider of sections of grass at one time. The more grass you can trim in one sweep, the faster your job gets done. You also have the option of changing the trimming mechanism attached to that head. By default, string trimmers use string or line to trim grass – it's in the name, after all! 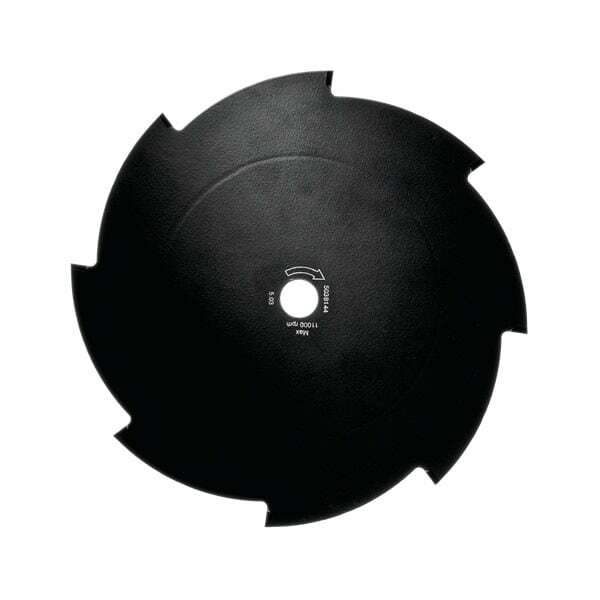 But because of their straight shaft design, commercial trimmers can use trimmer blades in place of line. Against a spinning metal or plastic blade, most weeds won't stand a chance. Landscaping professionals use their equipment eight hours a day, five days a week – sometimes more. They need tools that will stand up to hours of wear and tear. With components like these, commercial-grade trimmers aren't just able to last through long hours of run time. They're also better able to withstand bumps from traveling in the back of a truck or trailer, sun exposure from being left outside during a break, and everything else that comes before and after the work shift. We think you get the idea: professional users need powerful, durable pieces of equipment. But because they spend so much time working, that equipment should be safe and comfortable to use, too. With these features on their trimmers (and the proper safety gear in place), commercial lawn care specialists can look forward to greater ease of use and a lower risk of work-related injury and strain. 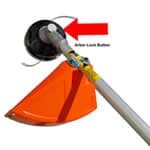 Plus, the bicycle handles available on some (but not all) commercial-grade trimmers are required by OSHA whenever a trimmer uses a blade instead of string or line. Although D-shaped handles can also be used if the trimmer has a barrier bar in place, bike-style handles make it easy and convenient to be OSHA compliant on the job. When a string trimmer is used more than 40 hours each week, it's bound to show some signs of wear. Commercial-grade gas trimmers are made to withstand all of that use, but when it does come time to take care of your string trimmer, you can be assured that you won't have to take as much time to do it. 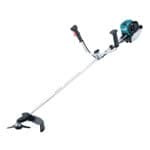 Commercial Gas Handheld String Trimmer Buyer's Guide.. Our Power Equipment Direct how-to library can help you learn about How to Measure Cordless String Trimmer Power, Straight Shaft vs Curved Shaft String Trimmers and 2-Stroke vs 4-Stroke String Trimmers.